Full eternity princess diamond wedding ring. Bespoke ring, designed and made to order. With a fully set band of princess cut diamonds all the way around. The princess cut diamonds are E VS1 grade. They fit edge to edge, giving the impression of a sheet of diamonds glazing the middle of the ring. The diamonds are channel set, with a deep band of platinum. This ring would be great worn as a full eternity ring or a princess diamond wedding ring. The customer wanted a sparkly ring that she could wear on its own. 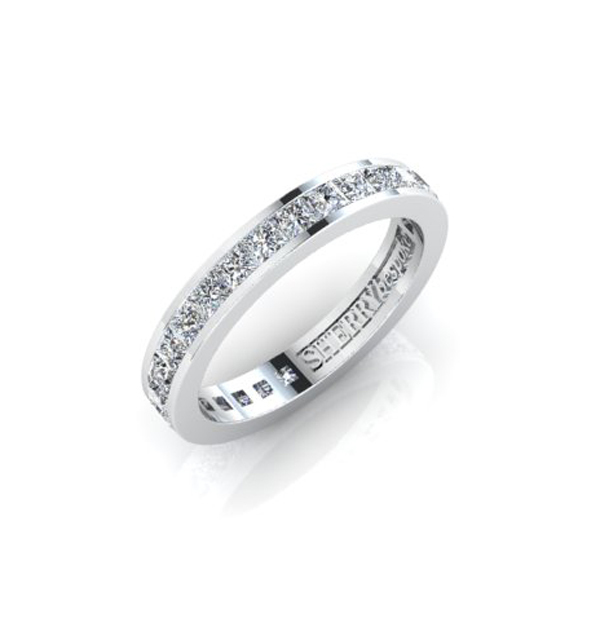 It combines the bling of a full eternity ring, with the simple statement of a wedding band. Set with 1.5ct of princess cut diamonds. These rings are bespoke made, to each client’s finger size. It takes precise calculation and skill to ensure that a complete number of diamonds will fit around the required finger size of ring. Each full eternity princess diamond wedding ring is designed and priced individually, depending on the wearer’s specification and size. This ring is made in platinum. We are able to make the design in any metal: 9ct gold, in yellow, rose or white gold. 18ct yellow gold, 18ct rose gold or 18ct white gold. We also work in 22ct gold, which isn’t readily available generally.